This time last year I was in France. The realisation came as a bit of a surprise as it seems like years since our last trip. In fact, out of the last four years, three of them I spent the best part of September there. 2008 we were in Proissans, near Sarlat. 2009 we spent the whole month near Beynac [near Sarlat. I love Sarlat]. Our best French holiday to date. 2010 for some reason we stayed in West Cork, which isn’t near Sarlat. 2011 we stayed in Genneton which is nowhere near Sarlat, or West Cork for that matter. The last trip was not the success of the previous ones. The weather wasn’t quite as good and there wasn’t much in the way of scenic spots. It was a sort of Ballinasloe with foreign accents. That was good though, as it took the hankering off us and we were quite happy to stay away this year. It is a beautiful day here today [and t isn’t often I say that] but there is a threat of damper weather next week. In France it would still probably be a couple more weeks of guaranteed sunshine so the feet are beginning to get twitchy again. I have found myself casually dropping into web sites offering holidays for next year. Why do I keep drifting in the direction of the Auvergne region? Cat – I have no idea whether I would or wouldn’t. I know nothing about the area apart from it being fill of volcanoes [extinct, I hope]. Ian – Maybe you should be my [spirit] guide? You know more about the regions of France than I. Though you may omit the sporting references if you like]. 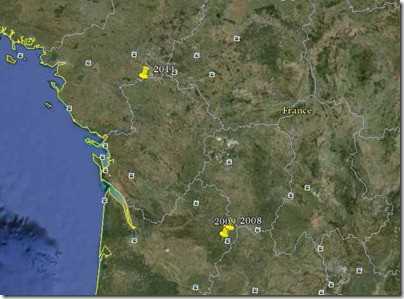 I haven’t a notion GD.. why do you keep drifting in the direction of the Auvergne region? Anne – “Stop talking about it and go!” Can’t for two reasons. One is that it takes over six months to get a pet passport for the dog [and I ain’t abandoning her so soon after rescuing her], and the pension doesn’t stretch to it this year.